Leonardo has a nightmare that he has a bionic hand, which he cuts off fearing that it’s part of Donatello’s cyborg armor attempting to take over his body. The hand instantly grows into a pair ninja turtles that attack Leo, attempting to “assimilate” him. Leonardo wakes with a start as Don comes into the room. Leo tells his armored brother about the nightmare hand, and Don informs him that he was fitted with a bionic hand yesterday, which Leo gapes at. Back at the Turtles’ lair, Leo and Don are testing the bionic hand’s ability under combat while Mikey and Horridus smooch on the couch. Casey, April and Shadow are riding in the back of a convertible, the centerpiece of a victory parade in Jones’ honor for capturing the reptiles blamed for the sewer killings. Unfortunately, the parade is being broadcast on TV and mob boss Big Tony spots Shadow. The old crook calls his nephew into his office and tells him to go get the girl. Pimiko attempts to finish off Raphael, but he was playing possum and turns the tables on her, grabbing a knife and cutting off her long ponytail. Raphael then claims vistory and the Council states that he must kill the woman, but Raph refuses, stating that he will run his branch of the Foot as he sees fit. The Japanese Council members laugh at the notion of Raphael calling them “his” Foot and they order the Soliders to kill the Turtle! As Mike and Horridus continue smooching, they’re interrupted by a super hero named Rock, who has come to fetch Sara for a mission. Mike is embarrassed, but Horridus invites him to kiss her goodbye. Nearby, Master Splinter plays chess with Dr. X, who thanks the stars that the immature Horridus is being carted away. Not too surprisingly, the New York Foot Soldiers immediately attack their former sensei, and Raph is caught in an intense battle. The Turtle takes pleasure in beating up those who used to follow him, since they changed loyalties so quickly. 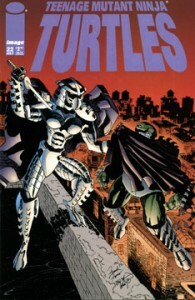 The mutant is severely outnumbered, so he leaps to a balcony to escape, where he meets the Foot doctor, Cheng, who directs him through a doorway. As Raph enters, he’s immediately knocked back (the healer explains that he has been a member of the Foot for thrity years, and thus his loyalty is to them, not Raphael). A figure walks into the room dressed in Shredder’s armor… a female figure! Raph assumes that it’s Pimiko, but then Pimiko herself arrives, leaving the Turtle utterly baffled.